No International shipping is available. This item ships to USA addresses only. The ChiaoGoo Amish-design yarn swift sits on top of a table with no clamping required. Non-skid pads help keep the swift in place while it's in use. 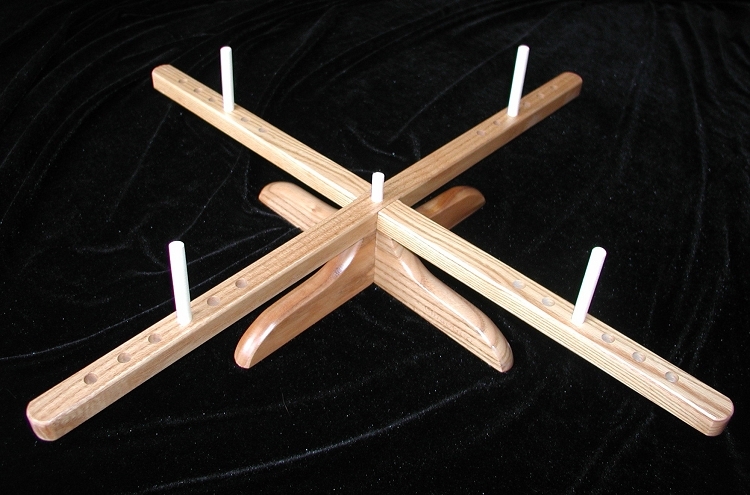 Four adjustable pegs allow for a variety of skein sizes (from 33" to 62"). This swift can be set up or broken down in a matter of seconds. The swift is manufactured out of Red Birch wood and the pegs are manufactured out of Basswood. They come in their own box for storage. This is the only swift I have ever used and I love it. Adjusts easily. Circles smoothly. It doesn't budge even when I've got it spinning pretty fast. And it breaks down into a compact box. I like it so much I've given it as a gift to our daughter and daughter-in-law. Q: What type of wood is this made from and what material are the pegs? Q: How big is this when setup? Q: How do you attach the yarn swift to a table to secure it? Or, is it necessary?